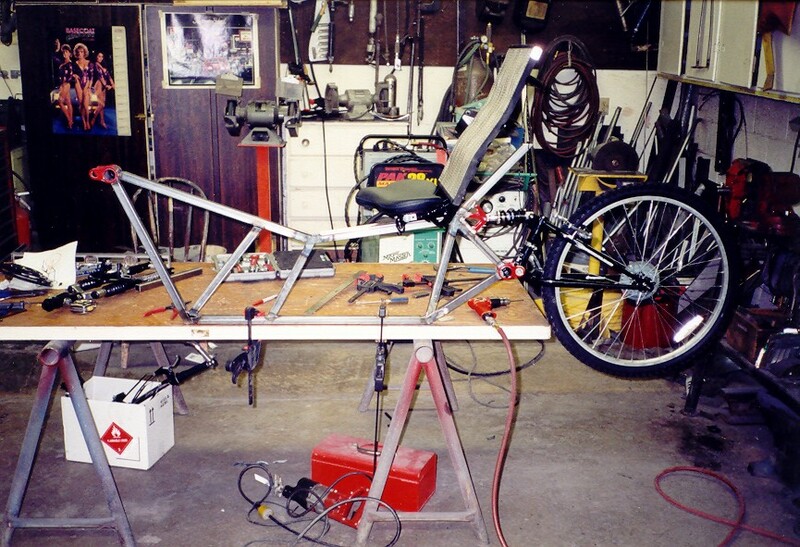 Here are a few early pictures of my human-electric hybrid trike. I put it together using two Walmart 26″ mountain bikes and a Currie F-18 Swingarm electric scooter. The basic design ideas came from adapting a Tripendo style front suspension to a trianglated steel frame. 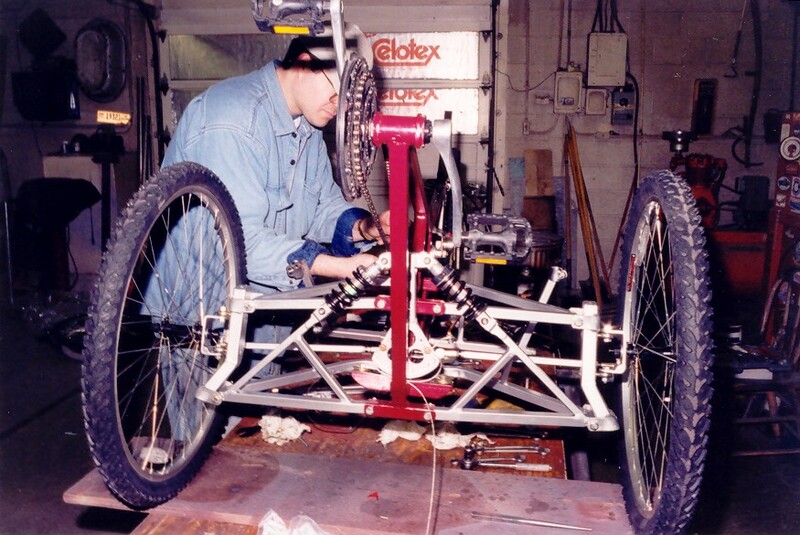 The interesting bits are that the front wheels can tilt into the corners with the main frame at angles up to 20 degrees, and the 600 Watt electric motor is coupled to the front cranks through freewheeling jackshafts such that all the power from both the electric motor and the human pedaling can be geared through the middle and rear sprockets. My father-in-law is a master welder who builds hot-rods in Idaho, and he helped me slap the trike together in two weeks over Christmas this past year. In the pictures, I’m still using the 26″ wheels from the donor bikes up front, but even with the tilting front end, I didn’t expect them to handle the side-loads. I’ve since replaced them with a really nice set of Jalco 20″ rims with stainless spokes and Primo tires (updated pictures soon). I’m using greenspeed front disc hubs now, but I haven’t had a chance yet to attach the disk brake mounts to my turnbuckles so I can set up the dual Avid mechanical disk brakes to the front. 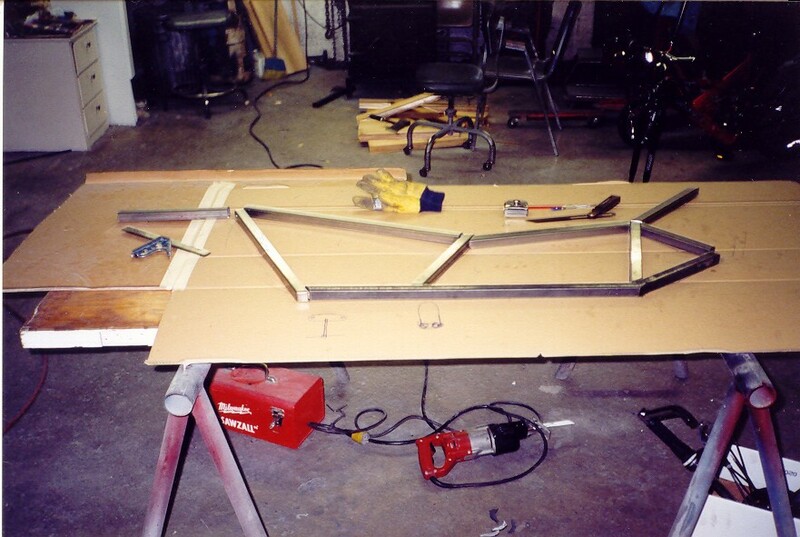 The intire frame is mild steel because this was simply meant to be a prototype design exercise to test the mechanics. However, it worked so well that I’m going to use it as a daily commuter as soon as I get the front brakes on, while I decide on design modifications for Prototype #2 (aluminum). Even though the steel frame and SLA batteries make the vehicle weigh in at a hefty 100 lbs., the electric motor more than compensates for the extra mass. In addition, being able to fully gear the electric assist gives me both outstanding hill climbing ability and high top-end speed. Mark L. Lupher, Jr., Ph.D.